In this wonderful story, that makes you think very hard about what you say to others, Val and her boyfriend Nick, created a list – a Hate List – about all the people that have ever made them mad over the course of their high school career. Everyone from Cheerleaders, jocks, even celebrities, just anyone that had ever made them upset. Val never thought that the Hate List, would be published or even be seen by others, but one day when ­­­­­Nick decides to take a gun and shoot the people at school that are on the list, her would is turned upside down. She is even shot, on purpose, by her own boyfriend. Nevertheless, life goes on and Val has to go back to school and try to act normal, even though she and her list started this mess. How will the people respond, her classmates, or even the teachers that were on the list? It is hard for her to go back to school without her loved one, Nick, in school beside her. Not even her old friends know what to do, how to handle the situation. It’s hard enough being the outsider, but it’s even harder being the outsider when everyone knows who you, and not for a good reason. What happens when Val finds out that the school has not really changed at all, the people were still ignorant and rude, but one person, a person that Val never would of thought she would be friends with, but they become close, she is all Val has. This story is a wonderful strong compelling read, that leaves you just thinking…thinking about what you say to others, and how they take it. 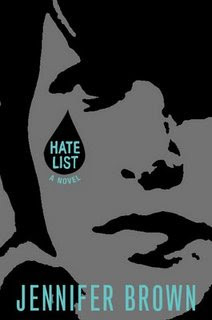 Hate List is published By Little Brown for Young Readers, and comes out this september! That doesn’t sound too original, so the writing must be pretty good to keep it interesting. sounds really interesying. I might take a look into that. This is my FAVORITE book ever!!!!! It keeps u interested throughout!! Ag!! I wanna read it again!! U should read it! Log in | 52 queries. 2.571 seconds.